Eva Hansson is a Senior Lecturer in Political Science and Coordinator of the Forum for Asian Studies, Department of Political Science, Stockholm University, Sweden, specializing in studies of democratization and/or political regime change, focused particularly on Southeast Asia. She teaches democratization, human rights and international politics. Among her publications are Growth without Democracy: Challenges to Authoritarianism in Vietnam (2011) and the edited volume, Civil Society and Authoritarianism in the Third World. 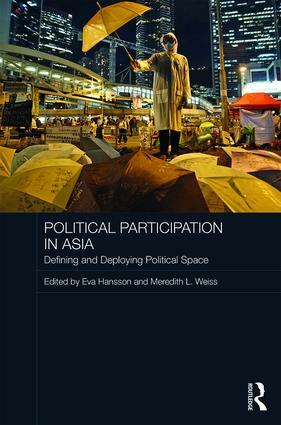 She has published chapters and articles on protest movements, inequality and political regimes in Southeast Asia, as well as reports on politics and political economy. Meredith L. Weiss is a Professor of Political Science at the University at Albany, State University of New York, US. She has published widely on political mobilization and contention, the politics of identity and development and electoral politics in Southeast Asia. Her books include Student Activism in Malaysia: Crucible, Mirror, Sideshow (2011) and Protest and Possibilities: Civil Society and Coalitions for Political Change in Malaysia (2006), as well as seven edited volumes, most recently, Electoral Dynamics in Sarawak: Contesting Developmentalism and Rights (with Arnold Puyok, 2017) and the Routledge Handbook of Contemporary Malaysia (2015).